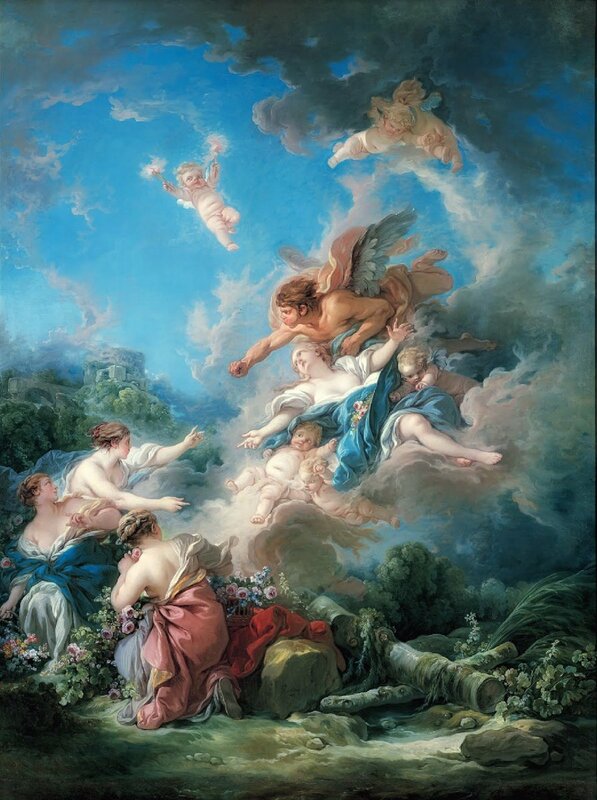 In Boreas Abducting Oreithyia Francois Boucher depicts a dramatic mythological abduction from a story in Ovid’s "Metamorphoses." Oreithyia was an Athenian princess, the daughter of King Erechtheus of Athens. Boreas, the god of the north wind, saw Oreithyia and immediately fell in love with her. Unfortunately, his love was unrequited, and this is where the story takes a turn. Oreithyia, being like many other people, enjoyed playing by rivers. You can jump in them, listen to the water, look for frogs, collect flowers, things like that. So when Boreas saw her collecting flowers with her sisters by the Ilissus river, he realized it was the ideal moment to abduct her. She would never expect abduction while doing something as peaceful and fun as looking for flowers by the river with her sisters. To do the deed, Boreas took advantage of the fact that he was a winged god capable of shrouding himself in clouds. He swooped down in a thicket of clouds and picked her up from her river frolic. He pulled her into the clouds and took her to a cave in Thrake, where she became his unwilling wife and unwilling mother of his children. While the story is a dark one for Oreithyia, she did become an immortal god in the process. The god of chill mountain winds. That’s why whenever I’m sitting on a ski lift or going for a hike, and I feel a cold wind on my face, I pour out a little hot chocolate in remembrance of Oreithyia. Boucher’s Boreas Abducting Oreithyia was a piece indicative of a major trend in 1800s art. The trend was to take inspiration from the Latin poets (i.e., Ovid and Horace) and turn their stories into dramatic paintings that showed off the painter’s skills and creativity. Boucher painted countless mythological scenes. He also happened to possess a unique penchant for monetizing his art. He would reproduce his work on various porcelain items that Parisians would purchase for their homes. For example, his paintings appeared on cups, plaques, saucers, and snuffboxes. In this regard Boucher was like the OG Jeff Koons, who collaborates with people and companies like Lady Gaga, Jay-Z, Google, Dom Pérignon, BMW, and Snapchat in his work. This painting was initially one of a series of six mythological-based paintings composed for Jean-François Bergeret de Frouville's hotel in Paris in 1769 - just one year before Boucher would die. It was then passed along for over 150 years down a long line of wealthy French people (mostly hotel owners for some reason), until Nazi occupation, when the painting was abducted (pun intended) from the Rothschild family and taken to Germany. The painting would later be restituted to the Rothschild family in France, before being sold to the Hallsborough gallery in London and then the Kimbell Foundation in Ft. Worth, Texas. Kimbellart.org. (2018). Boreas Abducting Oreithyia | Kimbell Art Museum. [online] Available at: https://www.kimbellart.org/collection/search/view/891?text=Boreas Abdu... [Accessed 27 Jul. 2018]. Lacma.org. (2018). [online] Available at: http://www.lacma.org/sites/default/files/reading_room/Compressed7New P... [Accessed 27 Jul. 2018]. Theoi.com. (2018). ORITHYIA (Oreithyia) - Wind Nymph of Greek Mythology. [online] Available at: http://www.theoi.com/Nymphe/NympheOreithyia1.html [Accessed 27 Jul. 2018].